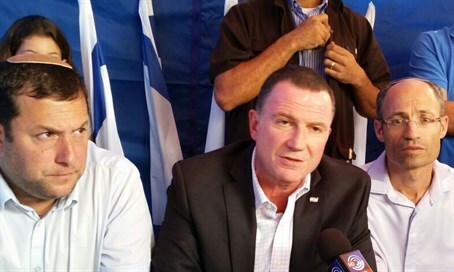 Knesset Speaker Yuli Edelstein (Likud) on Tuesday afternoon visited the protest tent established by Samaria Regional Chair Head Yossi Dagan last Friday in front of the Prime Minister's Residence. The protest, started last Friday after the funeral of a young couple who were murdered by terrorists in front of their children, calls on Prime Minister Binyamin Netanyahu to take harsher steps to keep Israelis safe from terror. That call was strengthened after the murder of two Israelis in a stabbing in the Old City on Saturday night. "I express here my condolences for the families of the murdered," said Edelstein. Speaking about his position as a leading Likud MK, he added, "I've already been asked if I feel comfortable being here - it isn't a matter of being comfortable or not. I feel an obligation to arrive here as Knesset Speaker, to come and sit with the representatives of the public that has suffered from terror." Joining Edelstein and Dagan in the protest tent was Gush Etzion Regional Council Head Davidi Perl, Beit El Council Head Shai Alon, MK Oren Hazan (Likud) and Yesha Council Head Avi Roeh. Edelstein said that while he tries not to give the government suggestions about how to conduct itself, as a citizen he expects the government to take decisive action and end the wave of Arab terrorism. "My position is known - that we don't need to wait for attacks in order to build, it's the obligation of every government," he said. "We, as residents of Judea and Samaria aren't class B citizens, we feel like suckers that are being butchered and we're without any response." "We're here to stay," emphasized the Knesset Speaker, vowing, "my door and the door of most Knesset members is open to you all." Avi Roeh, Yesha Council head and Mateh Binyamin Regional Council head, also spoke, saying, "the government of Israel must give us hope and implement sovereignty on Judea and Samaria." "We're not talking about another home or ten homes in order to calm the protest - we're talking about implementing sovereignty."